L'Anse aux Meadows at the northern tip of the island of Newfoundland is a must see if you come all the way over to the island. For me being of Viking blood, it was extra special. I know Liz, Silvia and Jörg enjoyed it very much, but maybe not to the emotional extend I did. Back in 2005 when we visited some Viking graves on the Island of Öland in Sweden, I somehow could sense my roots..... a bit crazy.... but I felt it there and again here at L'Anse aux Meadows.. Admission here is free if you have your annual National Parks pass. 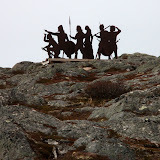 L'Anse aux Meadows National Historic Site and a UNESCO World Heritage Site. In the past four to five thousand years, many people have lived at L'Anse aux Meadows. Some of these people stayed longer than others. Among these people was a small group of Vikings. The remains of their camp, was discovered in 1960 by Helge and Anne Stine Ingstad. This archaeological site is the earliest known European settlement in North America or the New World. In 1978 the archaeological remains at the site were declared a UNESCO World Heritage Site. The exhibits highlight the Viking lifestyle. One can also explore the hiking trails to nearby bays and lakes. This hike can reconnect you to this land. The vistas are wonderful, the sea, the rocky terrain, the sub-alpine meadows, the boardwalks, just outstanding natural beauty. What is referred to as the Vinland Saga is documented in writing dating back to the 12th century. Prior to that, the stories where handed down by word of mouth. Among the Vikings that used L'Anse aux Meadows there were more then likely Erik the Red, his son Leif and other members of his clan. Erik the Red or Erik Thorvaldsson which was his real name, and his dad was Thorvald Asvaldsson. So the way Erik got his last name was that he was Thorvald's son, hence Thovaldsson. The "Red" part came most likely from his red hair, and/or could also have been a reflection of his apparent hot and pretty short temper. Before we talk more history. Here is a quiz for you: one of Erik's sons was Leif, what would his last name be? Answer at the bottom of the page. Erik the Red and his wife Thorild had four children, one daughter Freydis and three sons, Leif, Thorvald and Thorstein. Erik originally started a settlement on Greenland (he called it Greenland to attract people) and it eventually grew to around 2000-4000 people. Some of these people later set up the camp at L'Anse aux Meadows and it might have been just a summer camp to stop over to repair their boats..
Reconnecting and looking from a different point of view. The "Vinland" word is discussed a fair amount among Viking enthusiasts. Most likely it refers to the wild grapes on the East Coast of Canada. They mostly grow in Nova Scotia, New Brunswick and up the St Lawrence River, not on Newfoundland. Could it be that there are many more sites to be discovered here on the Atlantic Coast? The area around L'Anse aux Meadows is strongly influenced by the Labrador current and here icebergs are commonly seen, especially in the month's of June and July, however this vary every year. The cool maritime climate has influenced the vegetation of the area. The L'Anse aux Meadows site is dominated by barrens, coastal bogs, various berry bushes, and stunted forests locally known as tuckamore. This sub alpine tundra has over 280 different plants. Among this diversity of plants are many varieties of sub-Arctic-alpine plants; Cloudberry or referred to as "Bakeappel" in Newfoundland, being my favourite. Do the hike when you are there and experience this barren yet full of life nature trail. That makes our last name Elmerson! Loved all the Swedish/Viking/Norse lifestyle stuff at L'Anse. We have seen some artifacts like those in Sweden. Having them in Canada is even more special. I can see why Anders went "nuts" over it all. Sorry you are having repair requirements. Hope it gets fixed fast! Still impressed by the quality of the restorations.